From the ancient times of the Roman Empire the transport of water was crutial for the settlement and growth of cities in the current area of Northern Italy. Architectural forms and structures were raised forming an efficient supply system.In the present day the importance of this natural resource only grew stronger with it’s local shortages and deficit. 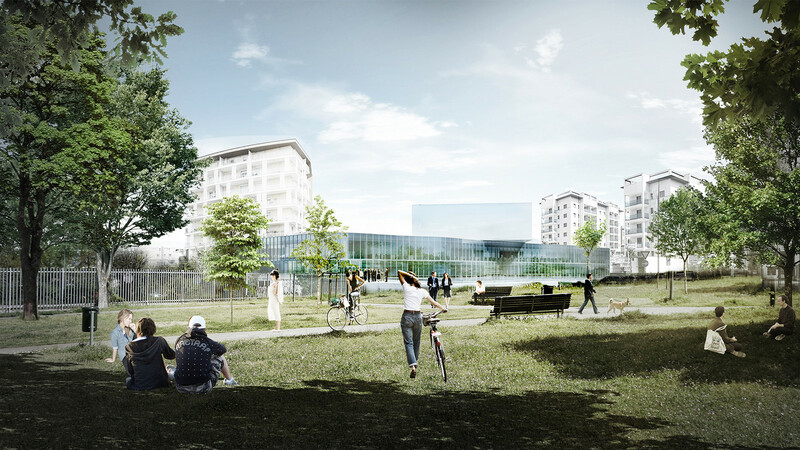 The new project in Milan is the headquarters office building for CAP Group which is the first Italian public company and a consortium of 190 municipal branches working with the management and delivery of water services. Beeing among the top companies in Italy that handle this natural resource it was important to showcase it in the design in many aspects – from the external looks to the way it is handled within the site. With the mission of assuring the supply of the water and all the services connected with it’s use, wastes collecting and purifying, the CAP Group HQ Building would develop a strong focus on the environmental themes. Laboratories which control the quality of distributed water and are one of the most important functions in this building would be highly exposed to ensure it’s importance.Together with the exhibition floor they would have an educational function to inform citizens and help school excursions, which already currently visit the building every week, to understand all the charactersitic and physcial composition of water and it’s supply. An additional issue to solve was maintaining part of the existing building operational during the construction process together with the department which has to constantly monitor the distribution of this important resource for the city.This was achieved due to a smart phasing proposal connected with an efficient people management scheme. Gruppo CAP is a recognised brand wich needs an appropriate building simbol.Water which is the main area of interest of the company would be exposed already from the outside and embbed in the core of the design with the facade and fourcourt resembling water movement. 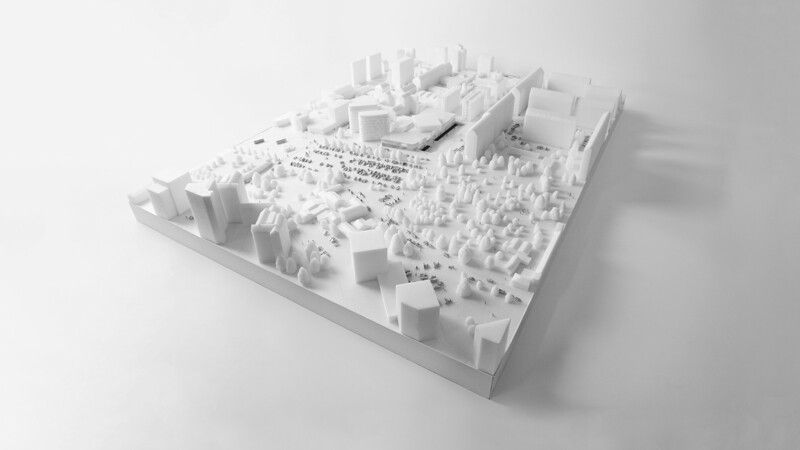 The potential of the area of the project is not currently efficiently used.It’s big enough to apply a water harvesting strategy what would stand in line with the company profile and it’s main theme – natural resources.This approach would be the highlight of the sustainable design of the new CAP HQ. The underground area currently used as parking for the CAP car fleet is in spite of all the obstructions a well lit area.It has a big potential for reuse with a new temporary and later permanent function giving insights into former building traditions and post-industrial district heritage. Keeping part of the existing building (the underground area) is a sustainable solution as it is not related with additional construction work and C02 emissions during the transport of building materials and soil. After refurbishing of this area the employees of via Rimini would be transferred to this isolated block to continue working during the construction process. By enlarging the opening in front of the old facade and inclining the surface more sunlight would be directed into the underground areas providing a more pleasant work environment. The front of the site facing the street would provide a generous public area covered with stairs which gently resemble in it’s form the movement of water. A water pond would be situated in the front of the building facing the main public entrance area.It would perform in different ways – from a purely decorative design element which provide water reflections on the facade to a safety buffer zone or an improvement of the facade performance during summer when it would help to combat the glazing overheating.In warmer days in combination with winds it could create on the other hand a fresh ambient for people to relax in. 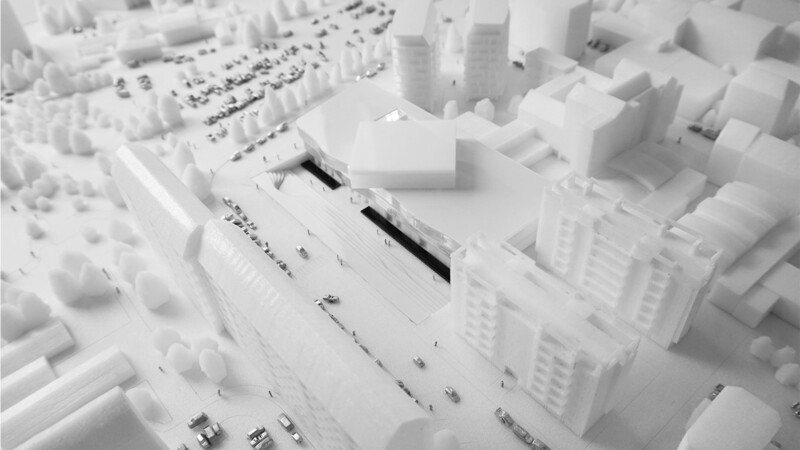 The large roof surface area would not be accessible and would be covered with a porous green permeable layer and entirely devoted to rain water harvesting.Run off water from the street and the inclined surface with stairs in front of the building would be stored in the pond,filtered and pumped to a water tank which would be positioned directly under the big frontal public space with stairs in the excavation of the previous office building. The new CAP HQ would consist of offices and large span functions in a two level podium and a separated lab block positioned on top of it and connected with a technical core with vertical circulation. Areas would be efficiently used by avoiding mezzanine floors. 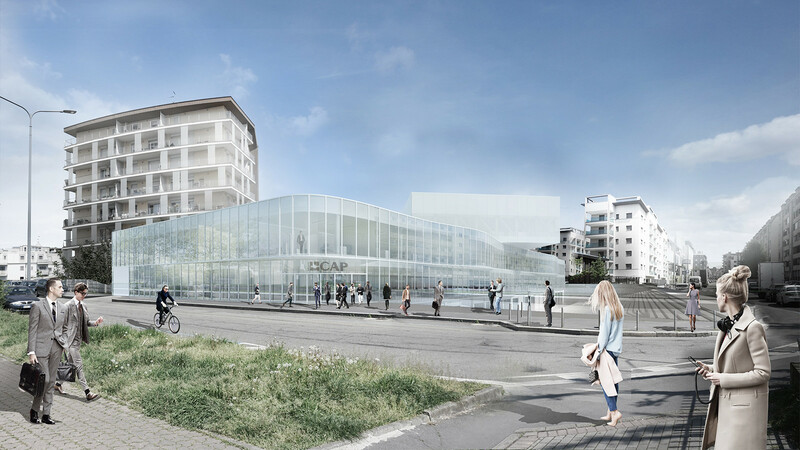 The net net floor area for the new building would be optimal to host the current via Rimini employees and the coming staff from other CAP Group branches. The proposed design solution is a typological alternative for common office buildings.It does not try to compete for the attention by using heights wich are not appropriate in a housing neighbourhood. Instead it focuses on a pragmatic approach to provide an efficient modular office scheme together with the landscape modified to bring out the best of the existing site.This new arrangement would respect the dimensional restriction of the area and the vincinity.The lab block on the top floor wich would provide a more iconic look to the setting would be oriented accordingly to the sunlight analysis of the surrounding building. The rotation of the lab block on top of the office podium is based on the solar analysis of housings in the close area. To prevent over shadowing of living spaces providing at the same time nice views an appropriate orientation was selected. 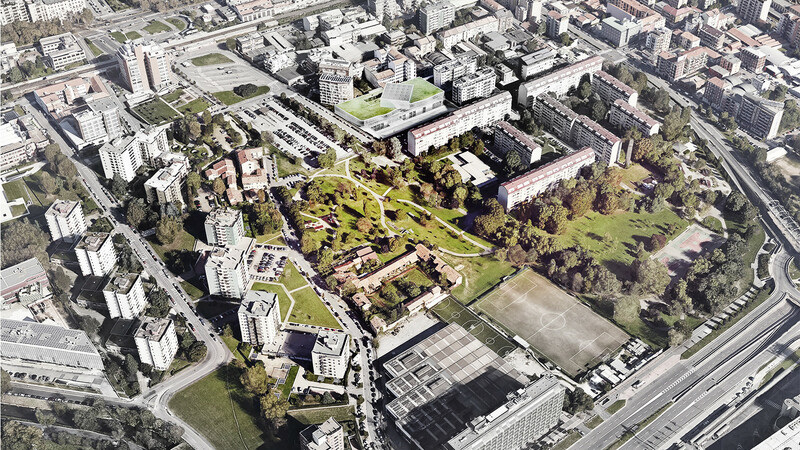 The restrictions in the area aacording to the PGT of Milan are respected in the design.The border distance and the offset from the other buildings near the area is maintained as the new building follows the existing heights of the building lines from north and west.The arrangement of the additional block is a result of phasing efficiency,rooftop maintenance and solar analisys of the internal courtyard’s adjacent rooms. One of the biggest challenges in the design process was to keep the existing staff in via Rimini during all the construction process and prepare the site for the incoming from other CAP branches employees .This was achieved through an effcient use of the undeground areas of existing buildings -Pallazina and Capanone withouth the need of errecting expensive temporary solutions. The building would be open to the public during special occasions like for example school excursions which take place every week.Their access to the lab facility which is always one of the main attaractions for visitors would be controlled through security checkpoints. 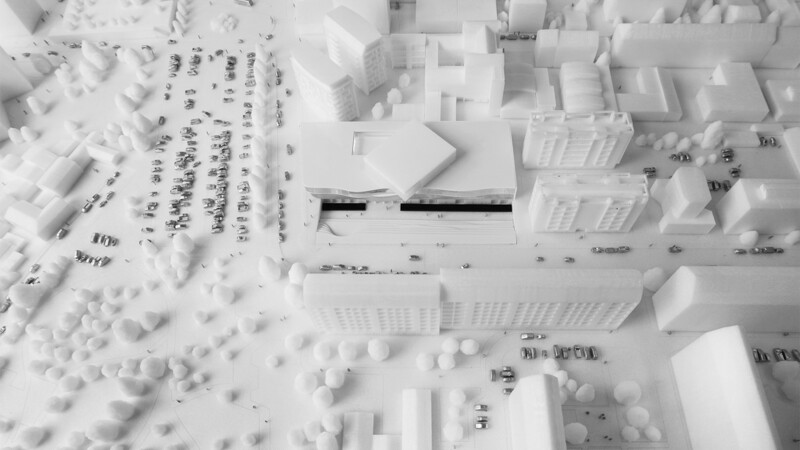 An efficient route would be provided to the employees which would access the building directly from the street level from the corner on Via Rimini through a secondary lobby. In the beginning before the construction, part of the via Rimini archives would be digitised which in result would allow to free up more precious space for the phasing of the construction to take place. The existing underground structural system is solid and rigid enough to withstand additional loads like a partially cantilevering block. The structural system would provide a lot of flexibility with a normal office construction dimension along the facade allowing to create single offices,group of offices and open spaces and a frame structure in it’s back for larger spans. Steel elements from the old building that could be useful would be melted and featured in the new structure wich declines the ammount of CO2 emissions during the production of building materials. The ventilation of the podium in the core would improve through a chimney effect the outlet of the gases from the lab. 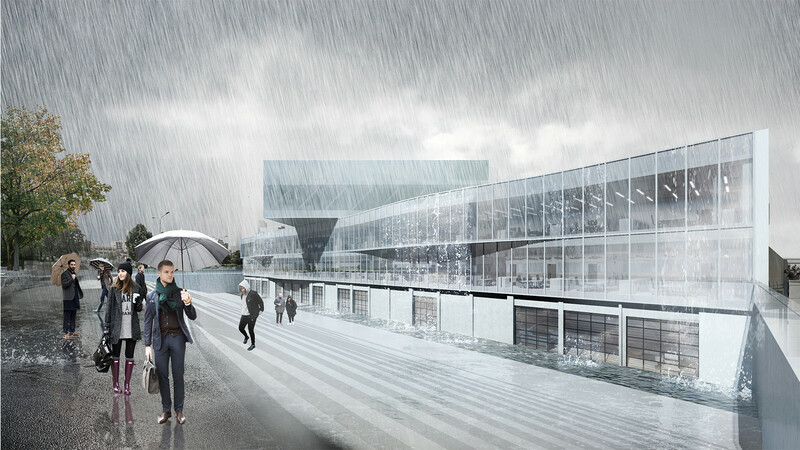 The core of the lab block would be connected with the service corridor of the podium but it would keep an independent ventilation and A/C system .The majority of the instalation shafts would be placed on the Lab rooftop so that the big roof could harvest more rain water without obstacles. Selected materials allow to achieve good thermal internal conditions and prevent overheating of the glazed surfaces without the need of additional facade elements.The cost of using a triple glazing with the Solar Factor g of less then 0,35 and the thermal Ug=0,5W/(m2K)would be similiar to other possible solutions. The current delievery path of the gas tanks/ bottles leading through the building poses serious threats for the safety inside. The new improved scheme would propose a delivery zone with a storage in the tall basement level where vans can enter. The facade would be based on the 135cm office module wich would allow to achieve different floor space configurations.Divison walls could be applied along all the elevations in order to create rooms in the working areas for permanent and temporary stay. The office block would be covered with a special type of glazing wich is translucent from inside-out only.From external views it is seen as a semi transparent white block typical for laboratories functions that are usually associated with sterility purity. A special layer inside the facade glass would allow to control the level of privacy, prevent overheating and at the same time would bring diffused sunlight to areas where direct light is not needed like the experiment rooms. The Lab block spacial organization would be improved by positioning working areas facing the facade and a big storage next to the technical and circulation core in it’s middle.Office areas would be grouped to provide the possibility for a different floor space arrangement. The construction could take place in a manner which would not be inconvenient for the neighbors with the site efficiently used in all it’s phases.Some buildings would be used as temporary shelter for incoming employees and later once demolished would provide additional space for construction cranes. New functions would be introduced on the site such as canteen, nursing or break room. The Company nursery would be an important function in the building with a private green courtyard. The access for partners of CAP employees would be available through the main reception. CAP parents would pickup their children by car entering from the parking level. During the lunch break a company canteen with a kitchen would service all the employees. Additionally a break area above it would be created next to the external garden where employees could relax. Fire regulations requirements would be met through the use of 3 emergency stairways with the middle one extending to the lifted laboratory block. Their radius would entirely cover the whole area of the building without the need to use additional expensive water sprinklers.